Candles are easy to use in science projects. Fire is an easy chemical reaction for students to observe, and there are many science projects about burning candles that are suitable for even young students to experiment with. All science experiments start with a question - what will happen if…? By applying different questions to burning candles, students can experiment with these controlled flames to discover how candles burn and what affects them. While more advanced projects will require specialized equipment, longer experimentation, and more dedicated study, they can be rewarding projects for exceptional students. Do candles made from different waxes burn differently? Use different types of candles of the same sizes and colors to find the answer. 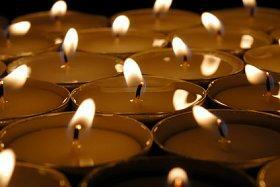 Consider paraffin wax, beeswax candles, and soy candles as options. Do frozen candles burn faster or slower than room temperature candles? Measure the temperatures of candles and record how long it takes them to burn a certain amount. Try both frozen and chilled candles as well as room temperature candles and candles warmed slightly in the oven. Do different colors of candles burn at different rates? Use the same candle sizes but different colors and record how much they burn in the same time. Alternatively, mark a certain amount for each candle to burn and record how long it takes each color. How does wick size change a candle's flame? Clip wicks to different sizes or shapes on different candles and record measurements and observations of the resulting flame. Does candle size affect oxygen consumption? Enclose a candle in a jar and record how long it takes to consume all the oxygen, then repeat for different sizes or shapes of candles. What is the composition of candle soot? Burn different candles and collect the resulting soot on sterile papers, then chemically analyze the soot to determine its components. How do burning candles affect air quality? Use air testers to measure pollutants before and after burning candles in a closed environment. Consider conducting multiple tests using different types of candles. An exceptional science project requires more than just a good question to answer. In addition to knowing what information to look for, it is important to control outside variables that may affect the experiment's results, and students will need to interpret their data carefully to draw suitable conclusions. 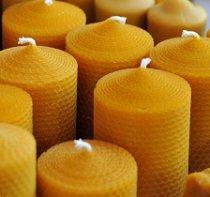 Do beeswax candles burn differently? If using multiple candles, be sure they are as alike as possible and only change the one factor being tested (ie., color). Conduct the experiment in a breeze-free area so environmental factors do not influence how the candles burn. If possible, conduct the same test several times to be sure there are no outstanding errors, and use an average of the results to draw conclusions. Record data such as candle size and burn time as accurately as possible, measuring in multiple ways to eliminate unintentional errors. When analyzing data, students should consider what factors might have influenced their results, such as human error, poor measurements, or uneven burning. A good scientist always admits when something could have been done better, and students who acknowledge the weaknesses of their work can help explain their results accurately. Use a fireproof surface and appropriate holders for all candles. Have a fully charged fire extinguisher nearby and understand how to use it properly. Do not burn candles near other combustible materials, such as papers or curtains. Always use proper equipment when taking measurements, such as high heat thermometers for measuring flame temperature. Only conduct open flame experiments under attentive adult supervision. From elementary school to college, there are many different science projects about burning candles that can give students an insight into the properties of fire, wax, and heat. By choosing a unique experiment and conducting it safely and scientifically, burning candles can be a fun learning experience.